Most of us believe that our memory inevitably deteriorates with age. While it is true that a majority of people face memory-related issues as they are getting older, it doesn’t mean that it has to be that way. There are a lot of healthy practices to keep your mind sharp, and here are some examples. Deteriorating memory is an experience faced by almost all of us as we age. Even in our younger years it happens that we easily forget things. We all had those strange situations in which we are searching for our keys and they are in our hand or you can’t remember your pin number that you used daily. That’s something normal, it’s called a sudden memory loss or just forgetfulness, but older people often complain about going completely blank when it comes to remembering the stuff that has been very familiar to them (home address or even names of their children). As we age, our bodies go through physiological changes that also affect our brain. Physiological change often causes glitches in our brain’s memory functions. If all is well for you, the worst case scenario is that you will forget something for a while and will remember it later. 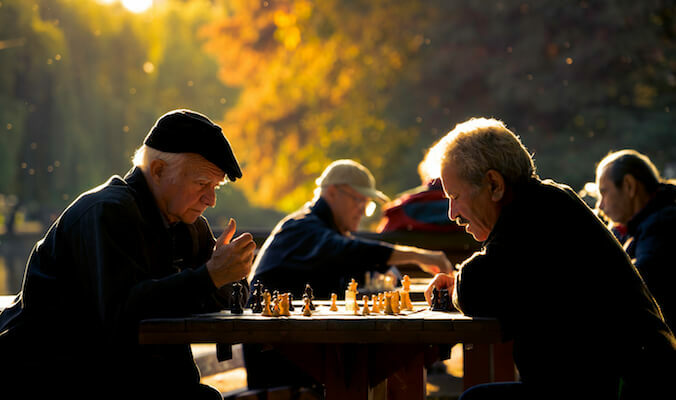 Now, the good news is that you can decrease the impact of ageing on your memory by performing certain healthy activities. So, we will discuss some of the most effective healthy habits that you can practice to keep your memory sharp with age. That being said, if you experience serious memory related problems, you need to be on the safe side and visit the doctor. Mother Nature gave us everything but it can just as easily take it away. If we show respect to nature all the remedies we need will be provided for us. The food we sometimes take for granted is much more powerful than we realise. Now we all know the common healthy foods and food groups that are good for us: fish, blueberries, asparagus and even some spices like ginger and cinnamon. This may sound a bit weird to you, but chopsticks are a great way to keep your brain active, we don’t want the brain to be in snooze mode even if it’s carrying out only it’s basic functions. Chopsticks require a great deal of attention and brain power to use. When you give this necessary attention and brain power to eating with chopsticks, it engages your nerve cells and stimulates your brain. Not just that, you should also use chopsticks when eating non-Chinese food too. Even if you know how to eat with chopsticks, give yourself a challenge and eat foods that you usually don’t with them like peanuts or Tofu Nao. This will ensure that using chopsticks actually activates your brain activity instead of activating your muscle memory. Special dietary supplements like ashwagandha may also help in improving your brain’s power considerably. Ingredients present inside have been known to traditional indian medicine for thousands of years. For instance, the ashwagandha root is known to be a calming agent that improves the attention and focus, and encourages choline production in the body which increases the efficiency of our brain’s functions. Medical research has shown that KSM-66 Ashwagandha-based supplementations significantly improve immediate memory and general memory function. Also one of the more known ones is Ginkgo biloba. It increases circulation to the brain and provides memory enhancing effects. It’s official that sleep helps in memory preservation. While older scientific research focused on the role of REM (rapid-eye movement), new research has come to consider the SWS (slow-wave sleep) phase. Sleep improves consolidation of our memory for recently encoded information. What it does is basically allows our memories to be shifted from so to speak RAM memory (random access memory) to the hard drive memory that will last forever. Just like there are foods that you can eat to improve your memory and brain function, there are ingredients that are harmful for your brain’s health. One most common ingredient that you should cut out from your diet is sugar. While natural sugar is actually healthy for us if taken in moderation, refined sugar can be blamed for a plethora of health issues. Alzheimer’s is now called type 3 diabetes for a reason. Unfortunately, the most easily accessible form of sugar is refined sugar and it is also used largely as a sweetener for industrial produced candy and sodas. It is easy to thinking that you have completely removed this unhealthy form of sugar from your diet, but refined sugar is sometimes hiding in places we don’t expect it to be. Check the packaging information on your low fat yogurt and BBQ sauce for instance. So, do your homework when it comes to this one. Educate yourself, research a little bit, always read and learn to understand ingredients on food labels, etc. It might sound time consuming, but you owe this one to your health.